Over 600 planetariums around the world have been showing the new discoveries recorded in this 280 page book. This research not only identifies what the real star of the Wise Men was, it also reveals from the Bible the exact date and time of day (within an hour and a half) of when Jesus was born. This surprising information comes directly from the New Testament (with the application of the science of astronomy). The research is backed up with extensive reference to Roman and Jewish historical records and gives the essential astronomical data that can make the New Testament account of the birth of Jesus to be very understandable and also majestic beyond compare. There were planetary conjunctions that happened in the heavens in the period when Jesus was born (3 to 2 BC) about which modern astronomers have expressed awe and astonishment. 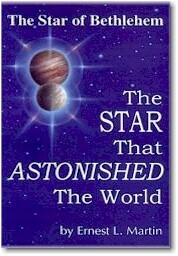 This is one book that all people interested in science and the Bible should have. It is easy to read and understand. This volume has potential readers among those interested in astronomy, astrology, early Roman history, mainline Christianity, students of Bible Chronology and Prophecy, religious teachers and university professors. "Prof. Martin has presented a reasoned argument which deserves to be considered seriously." - Prof. F.F. Bruce, Univ. of Manchester, England. "Convincing chronological conclusions." - Prof. Jack Finegan, author of "Handbook of Biblical Chronology"